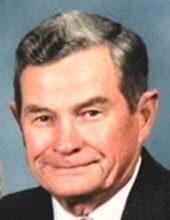 John TF Whitaker, 94, of Whitesboro passed away peacefully surrounded by the love of his family on Friday, April 5, 2019 at the Presbyterian home. He was born on December 18, 1924 in Yorkville, NY, son of the late James and Beatrice (Connell) Whitaker. He served his country with honor during World War II in the United States Army from 1943 to 1946. On September 22, 1951 at Trinity Lutheran Church in Utica, he was united in marriage to Ruth Petersen a blessed union of over 67 years filled with much love and mutual devotion. Mr. Whitaker was employed with Kelsey Hayes in Whitesboro retiring in 1986 after 33 years of dedicated service. He was a very active member of the Trinity Lutheran Church in Utica, where her served on many committees and was active in many church activities. He was an avid fisherman who also enjoyed fixing old clocks. He also was very proud of the fact that he built his own home. He was a loving husband, father and grandfather, who cherished the time that he spent with his family. He is survived by his wife Ruth Whitaker, his children, John (Annpatrice) T. Whitaker Jr of N. Syracuse, Susan Lazarek of Clinton, and Gary (Jill) Whitaker of Mexico, NY. He leaves his grandchildren, Joseph, Matthew, Travis and Austin Whitaker, also several nieces and nephews. He was predeceased by a son-in-law, Stephen Lazarek, and his siblings, William Whitaker, Lily Comenale, Mary Winstanley, and James Whitaker. The family wishes to sincerely thank the staff of the Presbyterian home for the wonderful care complemented by true compassion that was given to Mr. Whitaker during his stay there. Also a special thanks to the loving care he received by his caretakers at home. Funeral services will be held on Tuesday at 10:30 Am at the Dimbleby Funeral Homes Inc. Forty Main St. in Whitesboro with Rev. Peter Saie of the Trinity Lutheran Church officiating. Interment will be in Townsend Cemetery in Stittville. Family and friends are invited to call on Monday from 5:00 PM to 7:00 Pm at the funeral home. For those who wish please consider St. Joseph St. Patrick’s, Mother Marianne Westside Kitchen, 702 Columbia St. Utica, NY 13502 in his memory. Envelopes will be available at the funeral home. To plant a tree in memory of John TF Whitaker, please visit our Tribute Store. "Email Address" would like to share the life celebration of John TF Whitaker. Click on the "link" to go to share a favorite memory or leave a condolence message for the family.